Complete list of Social & Public Service in Pakistan. You can find the updated list of Social & Public Service in Karachi, Lahore, Islamabad, Rawalpindi, Multan, Peshawar, Quetta, Faisalabad and other regions of Pakistan with their address, maps, locations, vendors and consumer reviews. You can also compare the Social & Public Service here and find the best Social & Public Service here. You can also find the jobs related to Social & Public Service here. Nawa-e-Australia is the company located in Karachi and they are Representative of Urdu Community in Australia. QUEST NAWABSHAH is located in Nawabshah, Pakistan. Company is working in Education, Universities business activities. NUST TECHNOLOGY INCUBATION CENTRE is located in 112-B,Street 37,F-10/1, Islamabad, Pakistan. Company is working in Education, Universities business activities. HAMDARD UNIVERSITY ISLAMABAD is located in F-8,Markaz, Islamabad, Pakistan. Company is working in Education, Universities business activities. HAMDARD UNIVERSITY - INFORMATION TECHNOLOGY SERVICES is located in Karachi, Pakistan. Company is working in Education, Universities business activities. HABIB UNIVERSITY PLANNING OFFICE is located in Karachi, Pakistan. Company is working in Universities business activities. HABIB UNIVERSITY FOUNDATION is located in Karachi, Pakistan. Company is working in Universities business activities. GREENWHICH UNIVERSITY is located in Karachi, Pakistan. Company is working in Universities business activities. BAHRIA UNIVERSITY KARACHI CAMPUS is located in Karachi, Pakistan. A company is working in Education, Universities business activities. 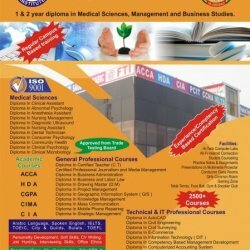 PMAS University is located in Rawalpindi Pakistan. Thet Offer Undergraduate, Graduate Level Agriculture, Basic Sciences, Computer Sciences, Management Sciences Degree Programs. KHIDMAT-E-KHALQ FOUNDATION is located in Karachi, Pakistan. Company is working in Social work services business activities. INTERNATIONAL PAKISTAN is located in Karachi, Pakistan. Company is working in Social work services business activities. ESHUL FOUNDATION PAKISTAN is located in Islamabad, Pakistan. Company is working in Social work services business activities. EOBI-EMPLOYEE'S OLDAGE BENEFITS INSTITUTION is located in Karachi, Pakistan. Company is working in Social work services business activities. ANSAR BURNEY WELFARE TRUST INTERNATIONAL is located in Karachi, Pakistan. Company is working in Social work services, Organizations business activities. AL-NOOR TRUST is located in Lahore, Pakistan. Company is working in Social work services business activities. AL-KHIDMAT WELFARE SOCIETY is located in Karachi, Pakistan. Company is working in Social work services business activities. UNIVERSAL EXPRESS KHI (PVT) LTD.
UNIVERSAL EXPRESS KHI (PVT) LTD. is located in Karachi, Pakistan. Company is working in Tourist information, Travel agents, Religion business activities. Oasis Travels (Pvt) Ltd. is located in Karachi, Pakistan. Company is working in Tourist information, Travel agents, Religion business activities. Karwan-Al-Madina Travel & Tours is located in Islamabad, Pakistan. Company is working in Tourist information, Religion business activities. Karwan-E-Islami is located in Karachi, Pakistan. Company is working in Tourist information, Travel agents, Religion business activities. Karwan-E-Hejaz-E-Moqaddus is located in Karachi, Pakistan. Company is working in Religion business activities. bdul Majeed Weaving Factory is located in Gujranwala, Pakistan. Company is working in Overseas business, Import and Export agents, Industrial services, Textile, Religion business activities.